Edmund Henning was born in 1786 at Toller Fracomb, Dorset, the son of John Henning (1746-1795) and his wife (forename unknown, but surname Rodber). Edmund was the eldest of five children; Edmund, John Masterman (b1816), Elizabeth, Mary and William (d1874). On 18 July 1822, at Alton Pancras, Dorset, Edmund married his cousin Ann Masterman Henning (1783-1851). They were to have three children; Edmund Robert (1824-1839), John James (1826-1870) - both born in Bradford Peverel, Dorset - and Harriett Ann (1828-1840) born in Winterborne Monkton, Dorset. Certainly by 1839 Edmund had moved his family to Yeovil where their son Edmund died. In the Somerset Gazette Directory of 1840 Edmund was listed as a Maltster of Hendford and in the 1841 census he was listed in Hendford with Ann and their son John, Harriott Henning (an unknown relation) and a domestic servant. Edmund gave his occupation as a brewer. His brewery, known as the 'Yeovil Old Brewery' was immediately opposite Hendford House (today's Hendford Manor) on the site now occupied by the Masonic Hall. The 1842 Tithe Map (see below) showed the brewery as Parcel 369 and the 1846 Tithe Apportionment noted that it was owned and occupied by Edmund. The Apportionment also noted that Edmund was the tenant of three parcels of land, all owned by William Davis; Langs Bush (Parcel 1002), Lower Milford (Parcel 1023) and Higher Milford (Parcel 1024). He was listed as a 'Brewer & Maltster' of Hendford in Hunt & Co's Directory of 1850, with a similar listing in Slater's Directory of 1852. During the 1840s Edmund was one of the trustees of the Yeovil Old True Blue Benefit Society. He was also a vociferous advocate of the railway being brought to Yeovil at this time, attending and partaking in several public meetings on the subject. Further, he was a member of the committee established to investigate the viability of Yeovil obtaining a Charter of Incorporation. In the 1851 census Edmund and Ann were still living in Hendford with a domestic servant. Edmund gave his occupation as 'Common Brewer' and living in the same house was maltster Philip Chant with his wife and daughter. Ann Henning died on 16 August 1851 at Yeovil. A 'common brewer' was usually a relatively large brewing concern, producing beer at a central brewery for distribution to a number of public houses, usually attached to the brewery by tie or direct ownership (as opposed to a 'brewing victualler' who was a publican ('licensed victualler') who brews his or her own beer, for consumption on the premises. Yeovil hostelries known to have been tied to Henning's brewery included the George Inn in Middle Street and the Pall Tavern in Silver Street. By the time of his death Edmund was living in Peter Street. Edmund Henning died at home in Yeovil on 2 April 1861, aged 76. His effects were valued at "under £100" (around £100,000 at today's value). His son John inherited the brewery which he sold off piecemeal within two months of his father's death. This is a portion of the 1842 Tithe Map showing West Hendford running along the top and joining Hendford which comes up from bottom left. 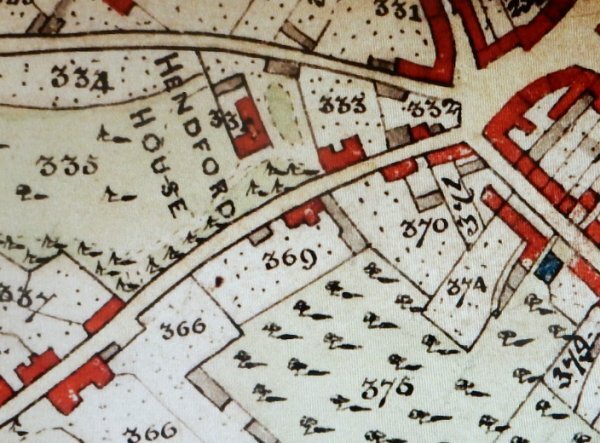 Hendford House is today's Manor Hotel and the Yeovil Old Brewery is shown at centre and marked as Parcel 369. Parcel 333 was John Batten's Yeovil Old Bank. 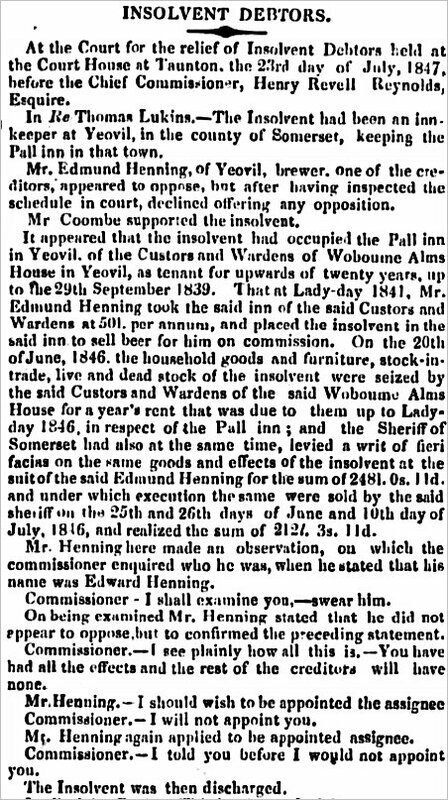 The report on the insolvency of Thomas Lukins and the involvement of Edmund Henning in the running of the Pall Inn, from the 28 July 1847 edition of the Taunton Courier. Edmund Henning's obituary from the 9 April 1861 edition of the Western Flying Post. The entry of Edmund Henning's burial in the register of Holy Trinity. The notice of sale of the Yeovil Old Brewery by John Henning following the death of his father Edmund Henning - from the 20 June 1861 edition of the Dorset County Chronicle.